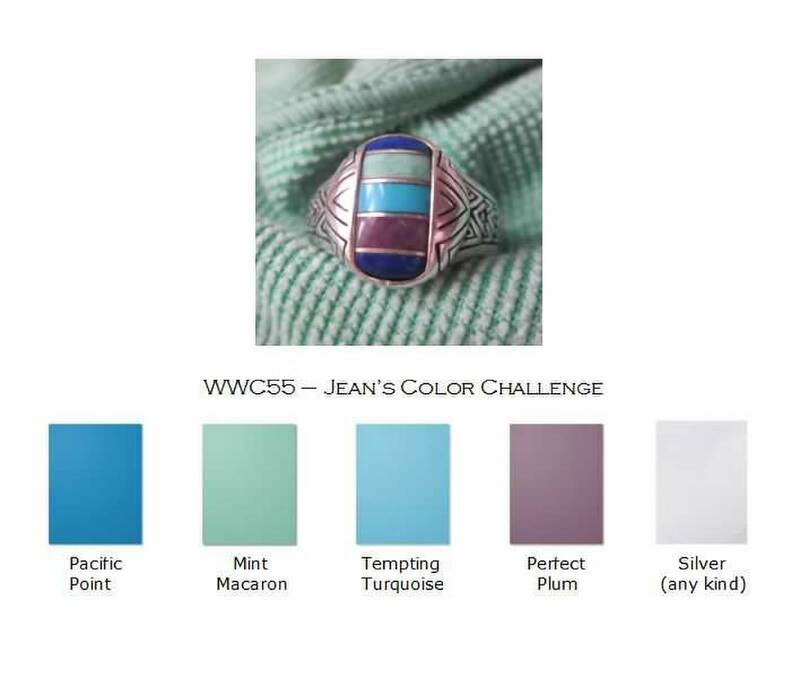 Welcome back to another Wednesday challenge with the Watercooler Artists! I hope you’ll be inspired by not only my project, but by the other cards the rest of the design team have put together. I figured that a lot of the rest of the design team would go for watercolouring, as that was my first instinct. So, I went a totally different direction! I used almost everything in this terrific suite – the A Nice Cuppa stamp set, the Have a Cuppa DSP stack and the Cups & Kettle Framelits (of course the stamp set & dies can be bundled for a 15% savings! woot!). I started by stamping each of the cups; I used the Pacific Point, Mint Macaron and Tempting Turquoise inks for those. I then die cut them using the framelits, and also die cut the design for the bottom cup from the retired Brushed Silver cardstock, and the design on the middle cup in Perfect Plum. I also die cut the spoon and fork from Brushed Silver (it’s a shame that cardstock is retired; I really liked it, and my stash is almost gone!). The pieces on the top cup are the pieces removed from the bottom cups die-cutting; how’s that for no waste? I took a panel of Perfect Plum cardstock (you’ll have to trust me on this – because the lighting does not do it justice) and embossed it with the Decorative Dots embossing folder. I then added a strip of the Have a Cuppa DSP down the right side, wrapped some of the Silver Cording twice, and tied it into a bow. I then stacked the cups, using Stampin’ Dimensionals, and tucked the spoon and fork in under the Cording. The sentiment was stamped in Perfect Plum ink onto Whisper White cardstock, and die cut using the Tags & Labels framelits. I tucked it into the tines of the fork so it would stand out. I’ll be looking for you – happy stamping! So pretty! 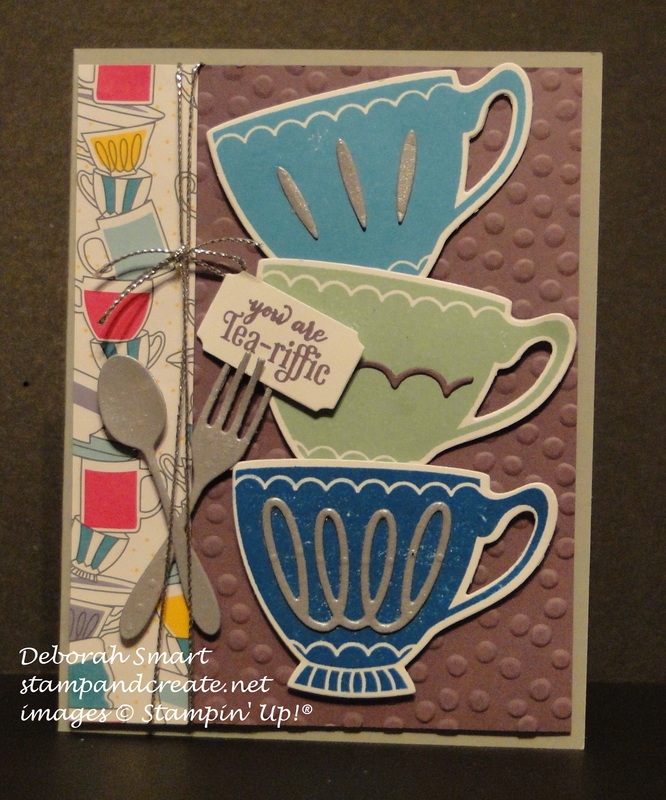 Love the die-cut tea cups with the dsp!